Until I started reading this book I didn’t realize how much my culture has influenced the way I think. I mean I knew it influenced me, but the book opened my eyes a little wider with regards to this. It isn’t just my culture that influences the way I think, but also the cultures I have adopted during my lifetime. I will try to shed some light on what I mean. In a society influenced by Christianity, I grew up knowing the story of Adam and Eve. The myth is that Adam was lonely so God created Eve from Adam’s side near his heart. Symbolically this implies women are second to man and more emotional than intellectual (she came from the area near Adam’s heart, not his head). And our society still reflects this belief in many of its behaviours. In a Babylonian story of creation there was only water in the beginning… waters on the land and salty waters of the ocean. The sweet waters of land were male and they merged with the salty waters of woman in the ocean and from this mixing together, life was created within her. The soil from the land was made fertile through sacrifice and hard effort from the gods. Through the blood of sacrifice of a god, man was brought to life, but this life is only to serve the gods. Growing up with this as a basis for belief leads one to understand their purpose in life is service to a higher power, or to those more powerful than himself. 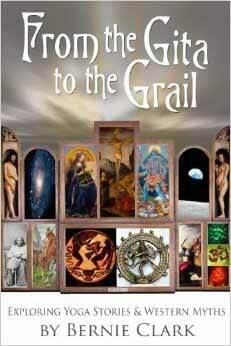 The myths in Bernie Clark’s book are far more detailed than what I have stated above, and after each myth is an explanation of how the myth leads one to their belief system. It soon becomes apparent how malleable our beliefs can be! The book takes a look at how myths affect us in our cosmological function, sociological function, psychological function and mystical function. The myths in these sections unveil how our beliefs guide us in how we live and interact with each other, how we view the spirit, what boundaries we live by (such as the ten commandments or the yamas and niyamas), how we love one another, our attitudes toward life and its struggles, and so on. Lastly we are given guidance on how we can transcend the boundaries created through our beliefs. It is a magical journey of stories that are sometimes very light-hearted and other times quite poignant and troubling. For me, the book gave me so much appreciation for all matter and species and their role in our amazing universe. It gave me a much deeper insight to the vast array of beliefs and where they came from while at the same time showed me how similar we all are with our search for our purpose in life. Bernie Clark sums up very nicely where this book can take you. “These myths are maps to our inner landscapes. These myths are models of the way we are supposed to behave. We all have our own maps, our own myths by which we live our lives. …A clue to your map can be found any time you find yourself thinking about the way things or other people, or even yourself, should be. The idea of should is based upon a map you hold internally; the map defines the way life is supposed to be. …It is easier to blame the outside world for not meeting our expectations of it than to go inward and find the flaws in our own map. This book is a great read that gives you a choice in how you live your life. Take your time in reading it while you discover why Siva dances on a dwarf, or Vishnu sleeps on an endless snake. See how your attitudes spark and change as you grasp a deeper understanding of the Eastern lifestyle as compared to ours in the West. I hope you enjoy the journey thoroughly!